The National Newspaper Publishers Association (NNPA) announces the launch of a global news feature series on the history, contemporary realities and implications of the transatlantic slave trade, according to NNPA President and CEO, Dr. Benjamin F. Chavis Jr. The night of Aug. 22 to Aug. 23, 1791, in Santo Domingo – today Haiti and the Dominican Republic – saw the beginning of the uprising that would play a crucial role in the abolition of the transatlantic slave trade. The slave rebellion in the area weakened the Caribbean colonial system, sparking an uprising that led to abolishing slavery and giving the island its independence. It also marked the beginning of the destruction of the slavery system, the slave trade and colonialism. Each year, on Aug. 23, the United Nations hosts an International Day for the Remembrance of the Slave Trade and its Abolition to remind the world of the tragedy of the transatlantic slave trade. U.N. officials said it provides an opportunity to think about the historic causes, the methods, and the consequences of slave trade. Experts said it’s important to never forget. And, with the approaching 500th anniversary of the date Africans were first forced into slavery in America, many like Felicia M. Davis, the director of the HBCU Green Fund, which invests in sustainable campus solutions for historically black colleges and universities, said she believes African enslavement demands reexamination. “The fact that slavery was underway for a century in South America before introduction in North America is not widely taught nor commonly understood,” Davis said. “It is a powerful historical fact missing from our understanding of slavery, its magnitude and global impact. 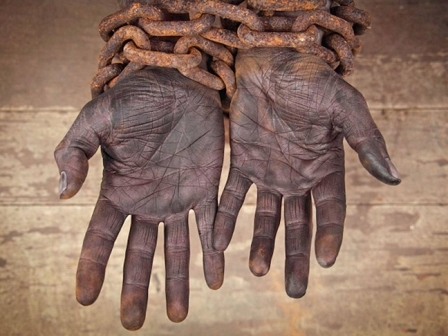 Knowledge that slavery was underway for a century provides deep insight into how enslaved Africans adapted,” she said. Far beyond the horrific “seasoning” description that others have provided, clearly generations had been born into slavery long before introduction in North America, Davis argued. “It deepens the understanding of how vast majorities could be oppressed in such an extreme manner for such a long period of time. It is also a testament to the strength and drive among people of African descent to live free,” she said. “From the compromises and moral equivocation in the founding documents during the Revolutionary Era – statements like ‘All men are created equal’ were written by a man who kept Black men and women as decidedly unequal as slaves – to the Civil War and Civil Rights Movement, the tragedy and terror of slavery are fundamental to the history of the United States,” Allison said. Today, the fallout from the events of Aug. 2017 in Charlottesville – brought about by a white supremacist rally and touched off the debate around the potential removal of a statute to a leader of the Confederacy – continue to weigh down the collective psyche of this nation, Allison continued. “Moreover, the rise in police profiling and brutality of Black men and the resulting rates of incarceration for African Americans highlight the ongoing oppression that was initially born in the crucible of slavery,” he said. Each year the UN invites people all over the world, including educators, students, and artists, to organize events that center on the theme of the international day of remembrance. Theatre companies, cultural organizations, musicians, and artists take part on this day by expressing their resistance against slavery through performances that involve music, dance, and drama. Many organizations, including youth associations, government agencies, and non-governmental organizations, actively take part in the event to educate society about the negative consequences of slave trade. Here in America, many organizations, activists and scholars are focused on 2019 as the anniversary of the arrival of the first Africans to be enslaved in Jamestown and 160 years since the last slave ship arrived, Davis said. Also, there’s a growing list of apologies for slavery from colleges and universities, local governments and corporations. Efforts are underway by the HBCU Green Fund to organize a national convening under the theme “Sankofa Remix” with three tracks: past, present and future. The goal is to examine history from an African American perspective, explore current impacts including backlash from the election of the first Black president, and crafting a vision that extends at least 100 years into the future that features presentations from artists, activists, technology, scholars and other creative energy. “It is encouraging to know that Black Press USA is focused on this topic. It is our hope that plans are underway to cover activities throughout the entire year,” Davis said, noting that 2019 also marks the 100th anniversary of the Red Summer Race Riots. “The UN Decade of African Descent 2015-2024 should also be highlighted as the Black Press USA leads this important examination of history,” she said. “Interestingly, the first and last slave ships to arrive in the U.S. both arrived in August. The HBCU Green Fund is working to put together a calendar of dates and observances. “We would love to work with Black Press USA to promote a year-long observance that helps to reinvigorate and support the important role that the Black press plays in the liberation of Black people across the globe. “We would be honored to have Black Press USA as a Sankofa Remix partner organization and look forward to collaboration opportunities,” Davis said.